Art Parts Creative Reuse Center 2860 Bluff St.
Free Opening Reception: Friday, April 12, 5:30 - 8:30pm. Includes, food, libations (21+), late shopping hours with a 50% off sale, and our popular "Three Questions" live artist interview at 7pm. In honor of Earth Day, Loveland plastic bag artist Heather Fortin Rubald transforms our in-house Bricolage Gallery into an enveloping space filled with color, texture, and dichotomies. The exhibit includes conceptual, decorative, and functional artworks created completely with plastic bags, challenging viewers to reconsider and re-imagine our love/hate relationship with the ubiquitous plastic bag. Part education on the global issue of single use plastic bags, and part art exhibit, you've never seen Bricolage Gallery like this! 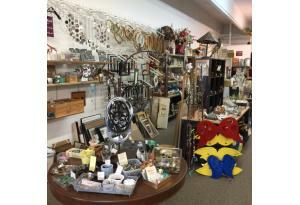 New 2019 business hours for Art Parts and Bricolage Gallery: Mon., Tues., Thurs., Fri., Sat. : 10:30am - 6pm. Wednesdays noon - 7pm. Open until 8:30pm on Opening Reception evenings.